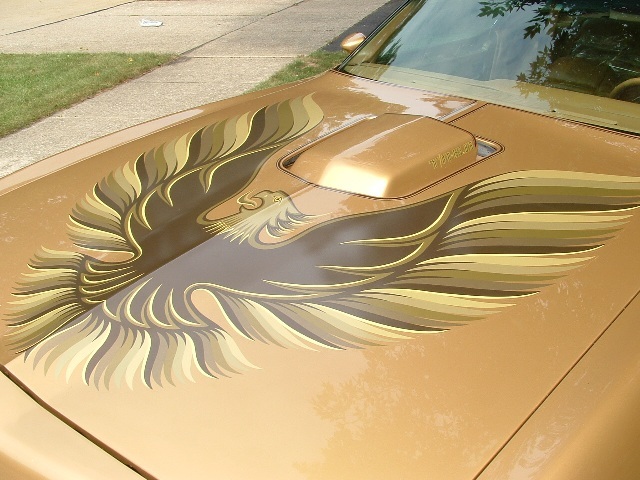 In 1978, Pontiac released the Y88 Gold Special Edition which had the Solar paint with brown stripes. The interior came in Camel Tan only, but you could order stander interior, or a deluxe vinyl or deluxe cloth interior. The gold wheel and t-tops with the blacked out tail lamps and window trim completed the package. 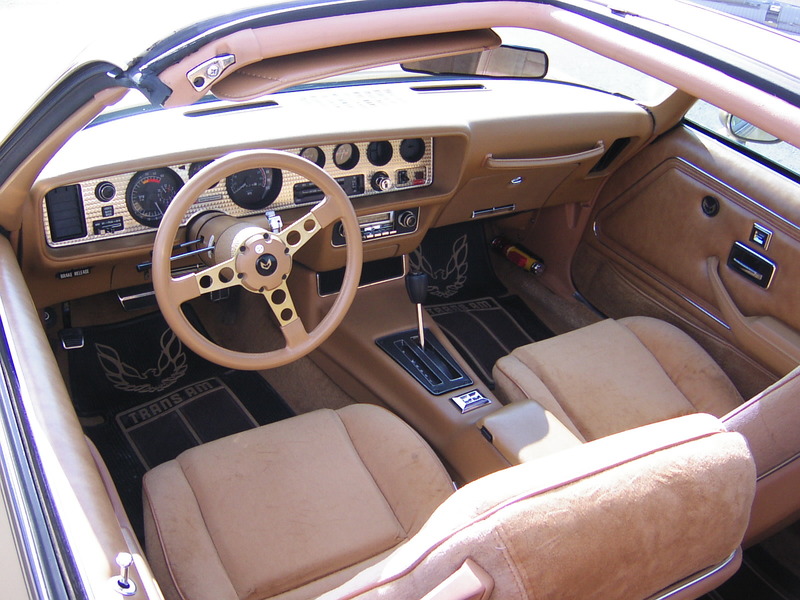 Most Trans Am's had a black steering column, but the Y88 Special Edition came with a tan steering column to match the interior. 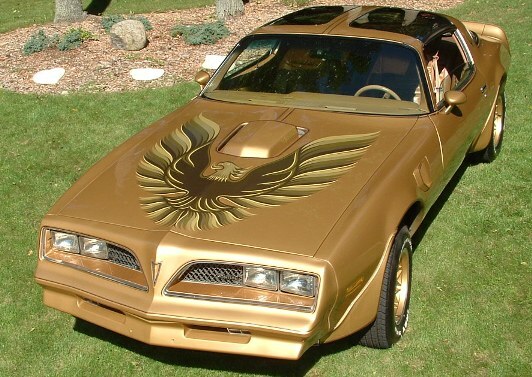 The Y88 Gold Special Edition Trans Am was in 1978 only. So, if you have any other year besides a 1978, then you automatically know you do not have a Y88 Special Edition Trans Am. 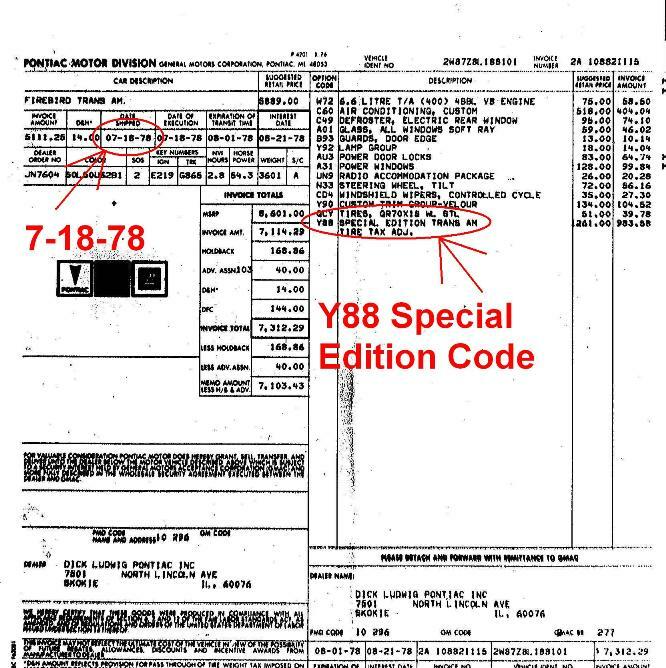 The first thing to look at is the Cowl Data on your Trans Am to see if it is stamped with a Special Edition code Y-88 or not. This is the first place to look. Now, not all Special Editions had this code marked on it. Some people try to tell you also that the paint code of 50 (also can be seen to the right) was for Special Edition Trans Am's. While they are correct to a certain point, that is not entirely true. 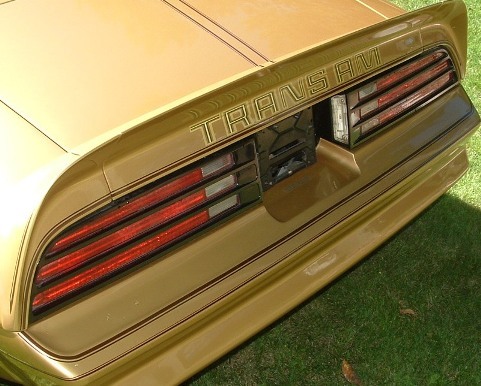 While Gold Special Edition Trans Ams did have a paint code of 50 and other Gold Trans Am's had a paint code of 55, once the Gold Special Edition Trans Am was cancelled, the paint code of 50 stayed for all gold Trans am's after that. So, just because you have a paint code of 50 doesn't mean you have Gold Edition. See the Dealer Bulletin below. Hopefully this will answer some questions on whether or not your car or a car you are looking to purchase is really a Gold "Special Edition" Trans Am. -- Gold 15x7 cast aluminum wheels (15x8 if the WS6 was ordered with it). Just like the Black Special Edition cars that preceded them, the Gold Edition Trans Am also had all of the gold appointments on the car. They had the gold bird emblem and gold spokes on the steering wheel. Gold Dash Bezel and gold shifter button emblem. Also, another thing that stands out on the interior is the steering column. On regular gold 1978 Trans Ams, the steering column was black, but in the Y88 Gold Special Edition, the steering column was camel tan. The Y88 Gold Special Edition was also the first introduction of the newly designed 5 color hood bird that became the standard in 1979. On the Y88 Gold Special Edition cars, the tail lamps were paint black. This was a change made in the 1978 production model year. Prior to this change, the tail lamps were painted the same color of the body, but this changed to black in 1978. 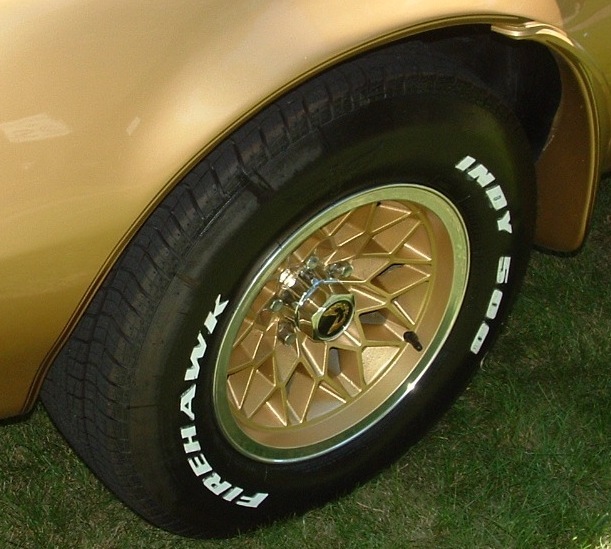 With the addition of the WS6 package in 1978, they introduced the 15x8 snowflake rim. In the beginning, the 15x8 inch snowflake rim in gold was painted in its entirety except for the outer lip of the rim. This was true of all gold snowflake rims in early 1978. If you have any more information than what is listed here or any corrections, send me an email and I will take a look and possibly add it to the site. Now the Gold Y88 Special Edition was on a limited run and you could only order it for about a three month period back in late 1977. They rolled of the line from about January 2nd to the end of the production year of 1978. 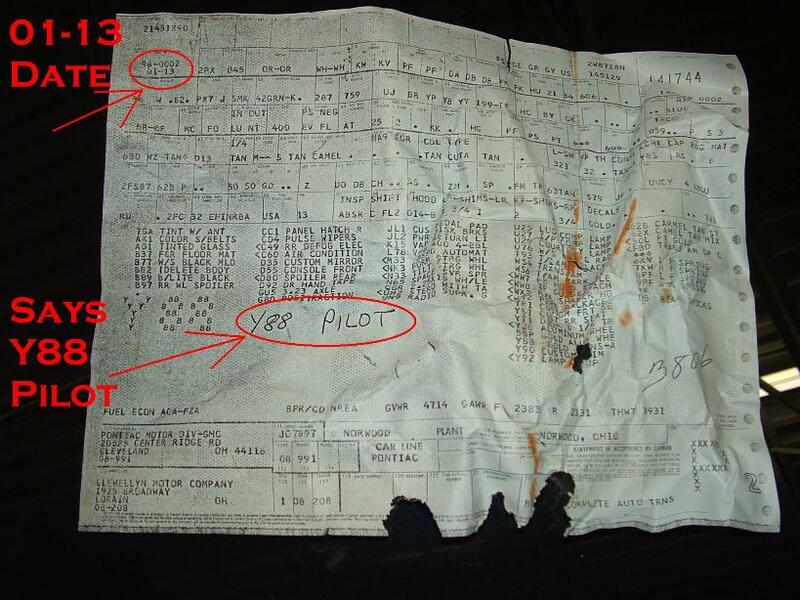 I do have two build sheets here from one of the first ones made January 13th, 1978 (which I own) and a late one of July 20th, 1978 (from Dave Fowler in Canada). Do you know of any earlier ones or later ones? If you do, I would be interested in seeing it. 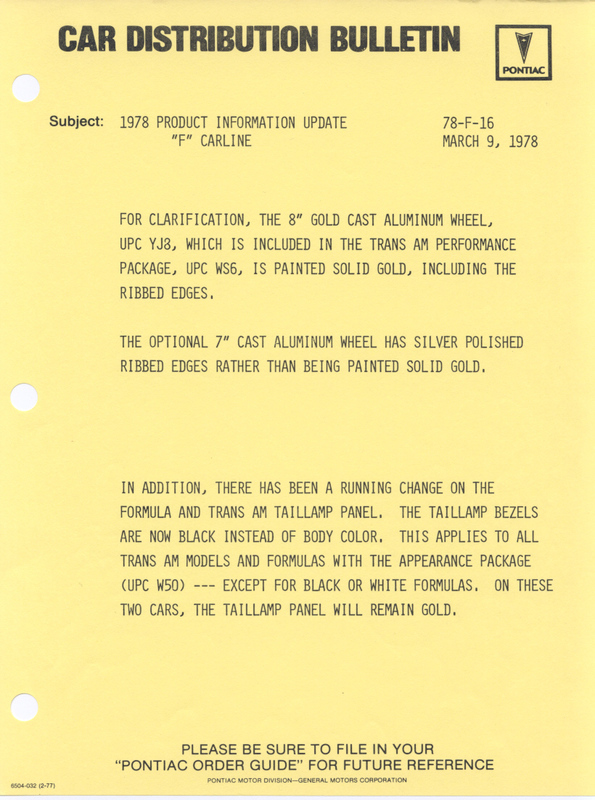 These are the main points above about the Y88 Special Edition Trans Am for 1978. If you take a look at my store, I do also have Dealer Bulletins and Sales Specifications for sale on USB which does contain more information about the Y88. More Dealer Bulletins about what was released when and the time frames of the running changes in 1978. It is a great resource for these cars that you might want to check out.